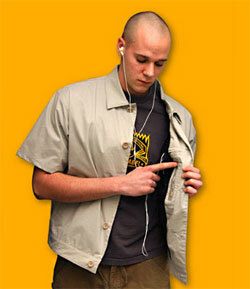 Koyono has introduced new Made for iPod clothing to their line of items for Spring and Summer 2006. The new additions to the BlackCoat line of outerwear, named Work, Sport, and Surf, each include ElekTex, a smart fabric technology from Eleksen Group that has been integrated into the lapels as iPod control pads. This allows you to leave an iPod tucked away inside a specially-designed pocket while giving you full control over all aspects of the iPod, including volume, track changes, and even the power switch. Each of the four new jackets includes advanced water protection and pocketing for commuting or travel. These coats are available now through koyono.com and will be available this month from, Amazon.com, PopXpress in the UK, iStuff in Italy and coolestshop.com. Additional retail availability announcements are expected this month.